10,804 others viewed this post. 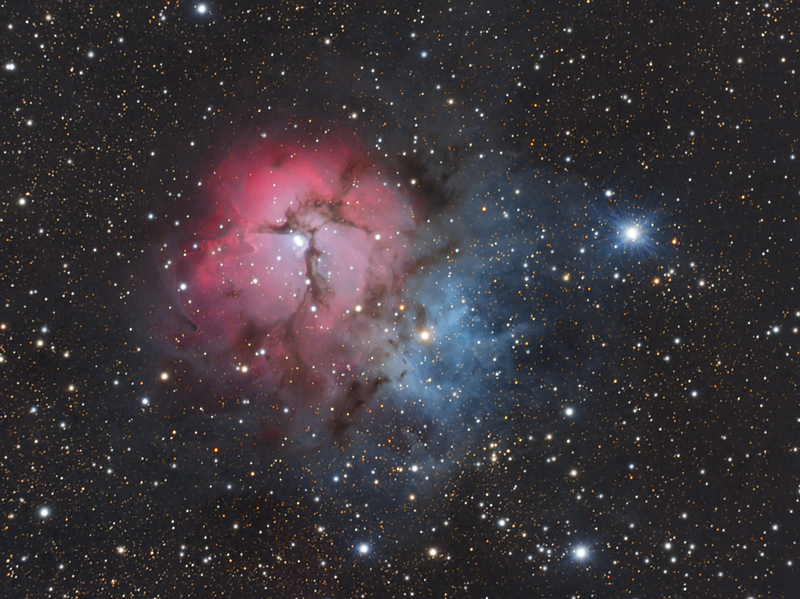 So happy to have a dream run of exposures for 102 minutes on the Trifid Nebula tonight! This spectacular little area is divided into sections of both emission (glowing clouds) and reflection (dark clouds with starlight on them). It’s a wonderfully dual coloured deep space star factory which isn’t common of nebula generally. Nebulas (nebulae?) are diverse and amazing looking but not always “classically” beautiful and balanced like this one. No hyperstar lens tonight, but I did use a Lepus 6.3 focal reducer for the first time on my Celestron 9.25″ Edge HD, coupled with the high resolution QHY12 CCD. This combination of focal length and pixel size doesn’t oversample or undersample the image so everything comes out at a nice sweet spot.